Got a chance to paint for a few hours this weekend. 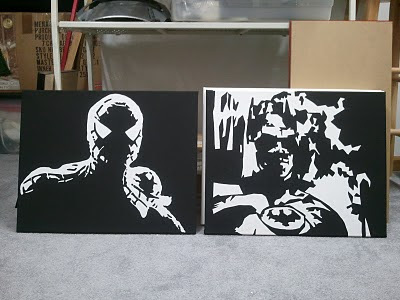 Started work on 2 of the many paintings I am planning on making for the Pinball Expo. 1990's Batman and Spider-man. Still got a lot more work to do on them, but they are taking shape. Fett is coming to the Pinball Expo!!! !